Ask the Visitor Centre for more details. Park Naturalists are always willing to answer questions about the snakes in the park. If you spot a snake in the park, contact the Visitor Centre our Snake Researchers get really excited about answering snake calls and questions too. You'll learn more about Killbear's nature and history at the park's fun-filled and informative programs, including children's programs, guided hikes, evening programs and special events. Check out the Upcoming Events to find out what will be happening during your stay at Killbear. Recreation Trail: This 6km linear trail is ideal for hiking, jogging, cycling, or nature watching as it winds through hemlock groves, hardwood forests and rock outcrops. Skill level: Easy/moderate. Lookout Point Trail: This 3.5km hiking trail winds through a variety of forest types to a breathtaking view of Georgian Bay from the Parry Sound side of the park. An interpretive trail guide about the ecology of the area is available at the trailhead. Skill level: moderate. 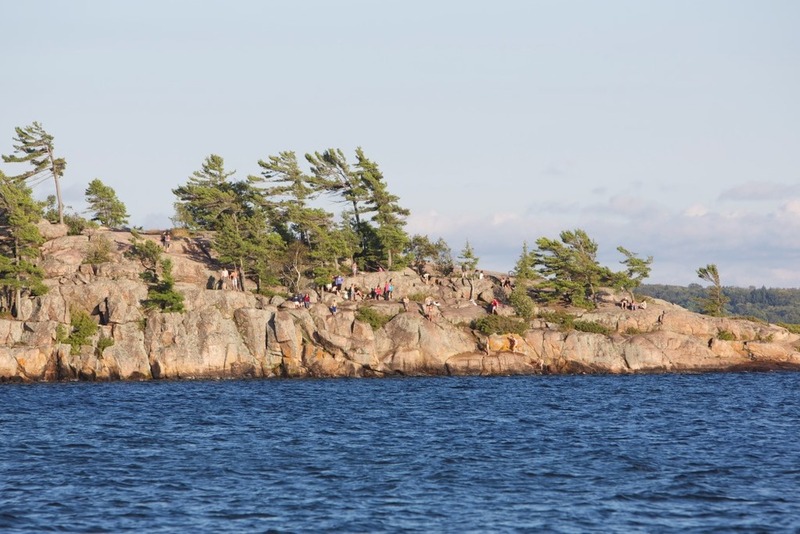 Lighthouse Point Trail: This 0.5km hiking trail loop takes you to the tip of Killbear Point where the Killbear Beacon has guided many a ship laden with supplies, lumber, oil, or tourists into the Parry Sound Harbour. Skill level: moderate. Twin Points Trail: This 1.8km hiking trail loop crosses forest, sandy beaches and bedrock ridges as it works its way along Killbear’s shoreline. An interpretive trail guide about the geological features is available at the trailhead. This trail has been designated one of Georgian Bay Biosphere Reserve's Amazing Places. Skill level: Easy/moderate. Shoreline Clamber: While there is no actual trail, the shoreline between Harold Point and Granite Saddle is an exceptionally fun area to hike. See dramatic geological features as you clamber from rock to rock. You can go all the way to Lighthouse Point along the shore and return via the Recreational Trail. Make sure you take some drinking water and a snack as this could take you over 3 hours. Skill level: Moderate/difficult. Visitor Centre: The Visitor Centre has great views towards the open water of Georgian Bay. 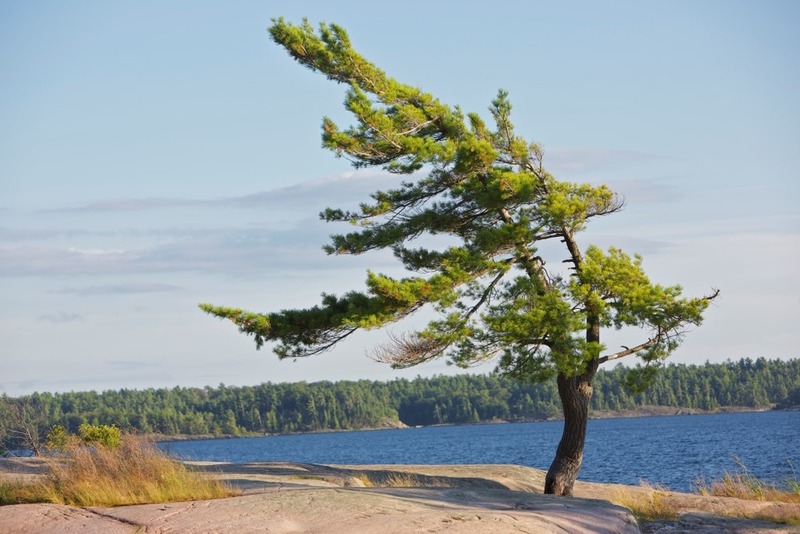 Sunset Rocks/The Tree: Possibly the most photographed tree in Canada, this windswept pine is located near campsite 320 in Beaver Dams campground. It shows the effects of dealing with decades of west winds off of Georgian Bay. Harold Point Viewing Rocks: There are beautiful views from these high rocks near Harold Point campground. Parking near the beach is limited so park at the amphitheatre and walk towards the beach. Day Use Beach and Twin Points Shoreline: Looking out on the tranquil waters of Kilcoursie Bay you can see the full length of the Killbear peninsula. A 300 metre walk along the Twin Points trail brings you to a beautiful pocket beach between two rocky points. Lookout Point: The scenic viewpoint at the halfway point on this trail looks eastwards over the islands and bays of the Big Sound. You can see the town of Parry Sound 10 km away. Lighthouse Point: There are great views from the trail and dramatic geologic formations at the tip of the peninsula. There are more than 4 km of beaches scattered along the Killbear peninsula. The longest beach is almost 2 km long and there are numerous smaller “pocket” beaches flanked by rocky headlands. Each campground (except for Georgian) has at least one swimming area designated with buoys. 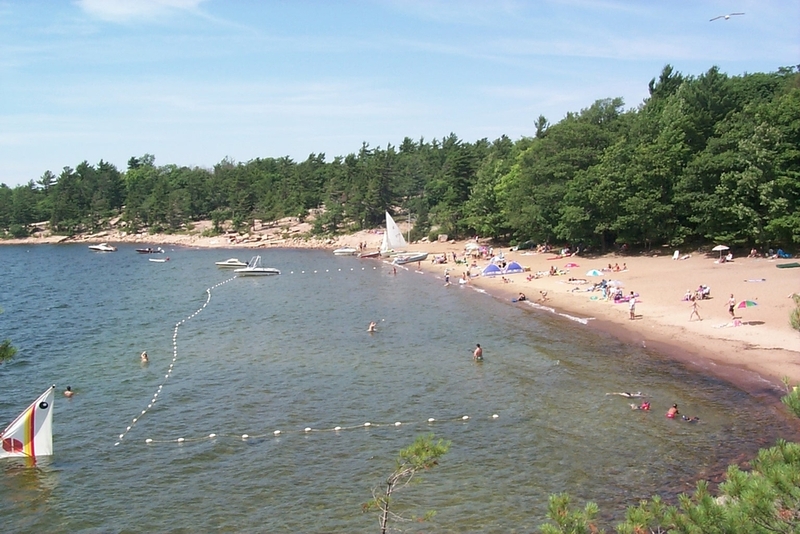 Most campsites are within a five minute walk of a beach, including Georgian campground which is very close to the beaches of both Harold Point and Beaver Dams campgrounds. Killbear even has two beaches for pets! While visitors may use any beach, parking for some campground beaches can be limited and you may find it more convenient to walk or bike. For the Harold Point beach it is best to park at the amphitheatre and then walk through Harold Point campground to the beach. There is plentiful parking for Day Use beach and the beach at Lighthouse Point. Families: The beach along Kilcoursie Bay is quite child friendly as it is usually protected from wind and waves. This is Killbear's longest stretch of beach. It can be accessed at Day Use, Kilcoursie campground or Beaver Dams campground. Picnic'ers: The Day Use Beach on Kilcoursie Bay has picnic tables, firepits, a picnic shelter and bathrooms. Windsurfers/Sailors: The intimate beaches at Harold Point and Granite Saddle campgrounds are often more exposed to the prevailing onshore westerly winds. Solitude-Seekers: Blind Bay campground has one small designated beach near the boat launch. Many people will also swim from the rocky shore. Shade-Lovers: The beach at Lighthouse Point has shade trees if the sun gets too hot. Pet Owners: There are two options for pet owners. One option is the Pet Exercise Beach near Day Use. To get to it, you hike 300 m walk along the Twin Points trail. Dogs must remain on leash at the beach since the beach is next to the hiking trail. The other option is the Pet Exercise Beach near Group Camp. The beach is a 250 m walk along a beautiful path through the woods. Dogs can be off leash at this beach.